It doesn’t matter where you live or how often you watch TV, chances are you’re relying on some kind of subscription service for your TV needs. But even though many people think they’re “old and useless”, outdoor TV antennas can still do quite a bit. They’re actually a fairly useful thing nowadays, and for some people they may just be the ideal solution. Before we start discussing why you may want one, let’s get one thing out of the way. An outdoor TV antenna isn’t for everyone. There are certain situation where it won’t do much, if anything at all, so make sure you’re one of those people who can actually make use of it. We’ll discuss this later, but we did feel like we should mention it. Now that we have that out of the way, let’s take a look at what outdoor TV antennas have to offer. We’ll talk a bit about how they work, and we’ll move on to the benefits of owning and using one. Without wasting any more time, let’s begin our benefits article. How do outdoor TV antennas work? An outdoor TV antenna, just like all other antenna types, is a transducer. It’s a device that takes electromagnetic waves and converts them into electricity, as well as vice versa. This is the reason why an antenna can be used both as a receiver, and as a transmitter. An outdoor TV antenna, though, usually only receives waves. With a signal that’s emitted from a transmitter or a satellite, the signal’s waves will induce electrical current inside the antenna. That current is then converted into video and audio, depending on what the radio waves’ frequency is, and is displayed on your TV set. An outdoor TV antenna can be used for more than one thing, but the main purpose is to receive TV signals, and that’s what we’ll focus on. What benefits do you get with an outdoor TV antenna? The main reason why you have a lot of people still using an outdoor TV antenna is to save some money. Satellite receivers cost quite a bit to install, and you also have subscription services that cost quite a lot in the long run. Many of us don’t really spend too much time in front of our TV, so paying that much for satellite TV or a subscription isn’t really worth it. Instead, with an outdoor TV antenna, you usually receive local channels for free. Another big one is the fact that depending on where you live, you may actually receive a lot of channels. You may find yourself in an area that has a lot of broadcast towers around you. An omnidirectional antenna can receive signals from most, if not all of them, and you’ll be getting quite a lot of free TV. The weather problem is another one you could potentially solve with an outdoor TV antenna. Anyone who’s ever used a satellite subscription knows that bad weather can make watching TV nearly impossible. However, if you have an outdoor TV antenna, that’s not as much of an issue. A good antenna won’t be affected by the weather, so you should be good to go. If you want to be sure, get a high-quality antenna. Last but not least, we have the signal quality, which directly translates into image quality. Any signals that are locally transmitted are not compressed, which means that you’ll get an image quality that’s significantly better than the compressed signal you would be getting from your cable provider. High definition channels are where this difference is most obvious, and you will notice the difference immediately. All things considered, there are quite a lot of benefits with an outdoor TV antenna. If you get a high-quality model, and place it carefully, you’ll be able to enjoy all of them. Why not just get an indoor TV antenna? You’ll find many people who will suggest that you could get an indoor TV antenna as a cheaper and simpler solution. However, there are a lot of compromises you’ll need to make with an indoor TV antenna, and most of them make it a bad choice. For starters, an outdoor TV antenna has the placement advantage. With the fact that it’s outside, usually on a higher point, you don’t have a lot of interference. With an indoor antenna, you have walls, as well as other objects that will impact the signal – something you want to be avoiding. 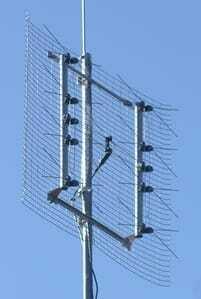 Next, outdoor TV antennas operate at higher frequencies. At an identical range, this means a better signal quality, as well as a better image quality. Also, you’ll get a lot more range than an indoor antenna. If you live far away from a broadcast tower, you may find that you don’t get any kind of signal with an indoor antenna. If we’re being honest, we must mention the advantage that an indoor antenna has – it’s much easier to install and set up. All you’ve got to do is plug in a couple of cables, and that’s about it. On the other hand, an outdoor antenna is straight up risky to set up, and you must be careful in order not to hurt yourself. Do the benefits of an outdoor TV antenna make getting one worth it? We were pretty upfront – they aren’t for everyone. If you’re spending a lot of time in front of the TV and watch movies and shows religiously, a subscription may be a better option, even if it costs you more. On the other hand, if you don’t have good reception where you live, or if you don’t spend that much time in front of the TV, an outdoor TV antenna may be the right choice for you. Using one is simple enough, and the benefits are obvious. You can find more great benefits article and recent articles by going to our homepage. Even though there’s actually quite a lot of services that completely replace the way we watch TV, it’s no secret that TV reception is actually hit and miss lately. There are a lot of people who actually prefer watching TV in a traditional way, with an antenna there are a ton of benefits. But, getting a signal isn’t always easy, especially if you live somewhere where you have quite a bit of interference. You may think that an antenna or a satellite dish will help, and even though they might, the price of admission is quite high. So, how do you solve this? What if we told you that you can actually make an antenna out of things you’re very likely to have in your household? To add to that, it won’t cost a lot, and it’s very far from being difficult. Not a doit yourselfer? Well we also have a guide for you to purchase the best outdoor tv antenna. A Guide for installing an outdoor tv antenna. Below, we at SerifTv have developed a guide that will show you how to make one. It is loosely based on the Antennas Direct DB4, which is discontinued, but was an antenna that had incredible reception. Now, before you begin, you’ll want to read through the entire guide. This will ensure you have the tools and materials at the ready, and you know what to do. The first step is to see where you’ll be putting the antenna. Ideally, you want it on a rooftop. If you can’t do that, you may put it on a balcony, but try to have it as high as possible. Also, make sure you have access to the place where you’re putting it, as you’ll need to work there, too. It may be smart to gather all the materials before you get started. The essentials are a piece of wood (3.5 feet long, 1” x 3”) as well as eight screws and washers, as well as eight coat hangers. Start with the screws, you’ll want two rows of four. Each row should be .75 inches from each side of the wood, one from the left, one from the right. The screws at the top should be 2 inches from the top, and the second, third and fourth in every respective row should be 5.25 inches apart from one another. Don’t screw them all the way in, though. This is where the eight wire coat hangers come in. You’ll want to cut their tops off, and unfold them into what is basically a piece of wire. It will be around 14 inches long, and you should fold it in the middle, so you have a V-shaped piece of wire. Each arm will come out at roughly 7 inches long, and the tips should be 3 inches from one another. The wire coat hangers should be attached to the screws. All you need to do is slide them down until you get to a point where the screw is basically resting at the base of the “V”. All of the hangers should be sticking out directly, and they must not be touching each other, as this can cause problems. The next part is to grab two lengths of insulated copper wire. This is how you want to run it: the wire should cross over between the screws at the top, and the second topmost screws. Then, it should go back between the screws at the bottom, and the second bottom-most screws. Since the wire is insulated, make sure you strip the insulation where it touches the screws, and also strip a piece of insulation at the center of both wires, between the second and the third screw. At this point, you can go ahead and tighten the screws we said you shouldn’t tighten earlier. Make sure both the hangers and the wiring are kept firmly in place. When you’re done attaching the hangers and wire on one of the sides, it’s time to go to the other side. Here, you’ll need a pair of 15” x 9” metal grill screens, along the length of the wood. Make sure the hangers don’t touch the grill screens. Back to the first side of the wood. You’ll need to connect an ohm transformer to the stripped part of the wire, at the center. This is basically the last step of the way, and the only thing that’s left is to mount the antenna. With a DIY antenna, you don’t actually have a mounting bracket to make things simple. You’ll need to find a way to attach it to the roof. If you have some kind of a pole on the roof, the simple method is to attach it to that. If not, you’ll need to find a way of securing it to the roof, and making sure it doesn’t fly off with the first wind. Once you’ve found a way of securing it, you should have it point towards the broadcast tower you want to receive the signals from. A service such as Antennas Direct will allow you to find the towers you have in range, and make things easier. When everything is set up and mounted, you need a coaxial cable that connects the ohm transformer on the antenna to your TV. Attach the TV end to the “Antenna in” jack, and voila, you’re good to go. You should be able to receive all the new signals that the tower you’re receiving from broadcasts. Summing it up – is knowing how to make an outdoor TV antenna worth it? If you aren’t really handy with tools and don’t have patience, you may be better off with buying one. However, if you prefer going the DIY route, the guide above should have you a fully functional outdoor TV antenna that works admirably. Good luck, and enjoy watching free TV! Outdoor TV antennas can be very helpful. They give you a chance of getting a few (or more) free TV channels without making significant sacrifices in terms of image sharpness or clarity. And, even though today’s most commonly used TV services are easy to set up, an outdoor TV antenna does require a bit more than that. There are a few things that need to be done if you want to use an outdoor TV antenna, but they’re pretty simple. We at SerifTV have developed a guide to help you along in the process! Want to make your own antenna instead? We have a do it yourself guide here. To help you, we’ve made a guide that explains how to install an outdoor TV antenna. We did our best to keep things simple, so even if you aren’t tech savvy, you can get things done as quickly as possible. One thing to note, though, is that your specific antenna may come with its own set of instructions. If it does (and chances are it will), make sure you have them ready so you can set it up properly, even with our guide. Let’s not waste any more time, and see how to install an outdoor TV antenna. If you are looking to buy the best outdoor tv antenna click here for a guide. The first step towards getting those free TV signals is actually done from the comfort of your own home. Your antenna should be pointing towards a broadcast tower (or more) that’s nearby. This is how they work, you can’t just have it point in a random location and expect signals. If you have neighbors that have outdoor antennas, you could ask them where their antenna is pointing. This should tell you where you have an antenna. Another option is to use a service like AntennaWeb. These services allow you to enter your address, and they’ll tell you where the nearest broadcast tower is. This should give you a good idea on where you’ll want to point it, and with some fine tuning you’ll get it just right. Oh, and also check out where you would put the antenna on your rooftop. Depending on how high it is, and how your rooftop is built, there are various options. Make sure you pick the one that works best for you and has the right benefits. Outdoor antennas are commonly mounted on brackets. These brackets are best assembled when you’re indoors, so you only have to install them when you go out. We’re pretty positive that you got assembly instructions in the box, so make sure you follow them, as they vary from bracket to bracket. Once you’ve got it assembled, you’ll want to grab the tools you’ll need for roof installation, and get to work. The bracket commonly screws in to stay secure. If you want to add some waterproofing as well, you should apply silicone caulk on the screws. This should keep water out of the way. While most antennas come preassembled, there are some that will require assembly before you mount them. This is another thing that you could do indoors, and you’ll most likely have instructions with it as well. If you want your antenna to work as intended, do follow those instructions. As soon as you have it assembled, you can mount it on the bracket outside. That mounting bracket has a sleeve that commonly has bolts on it. Those bolts should be loosened in order to slide the antenna in. The pole should get to the bottom of the sleeve for a secure installation. Once you’ve done this, just tighten the bolts to keep everything in place. The next step is to loosen the bolts on the sleeve of the antenna. The whole antenna should slide over the pole, until you have the pole at the top of the sleeve. This is where you should rotate the antenna for it to face the location of the broadcast tower. A rule of thumb is not to tighten the screws completely until you’re sure you have it pointing in the right direction and you’re getting a strong signal. It’s a bit too early to finalize everything, as the antenna will certainly require a bit of fine tuning before it works at its best. If you have someone with a few free minutes, now would be a good time to ask for their help. Grab a coaxial cable, and run it from your TV setup to the antenna. You should be adjusting the antenna on the roof, while the other person is in front of the TV, so they can tell you what position works best. When you have it figured out, tighten those bolts you left a bit loose. Remove that temporary cable, and get the one you’ll actually be using. You’ll want to ground the antenna, as this is a crucial safety step. Use a grounding block that’s connected to your house or building’s ground, and make sure you’re abiding by your area’s electric guidelines and codes. Make sure you take your time to secure all the wires. This should be done carefully, so don’t rush it. You should always do as much as possible inside your home, or on the ground. Do only what’s really essential on the rooftop itself. Be wary of any power lines, and try to stay at least 20 feet away if you want to stay risk-free. In the case of your antenna making contact with the power line, seek a professional, don’t remove it yourself. Make sure you grounded the whole setup properly, it is a big safety hazard. If you aren’t sure you can do this yourself, seek a professional. Avoid windy days for installation. Wind is definitely not a friend when you’re on a rooftop, you’ll want calm weather. As you can see, installing an outdoor TV antenna isn’t all that difficult. There are some precautions you’ll need to take, and a few things you’ll want to be careful about, but aside from that, you should be able to set it up easily! © SerifTV – 2019. The unauthorized use and/or duplication of this material without express and written permission from this blog’s author and/or owner is strictly prohibited. Excerpts and links may be used, provided that full and clear credit is given to SerifTV.com with appropriate and specific direction to the original content. Copyright Notice 2019 by SerifTV. SerifTV.com participates in the Amazon Services LLC Associates Program, an affiliate advertising program designed to provide a means for sites to earn advertising fees by advertising and linking to Amazon.com. Amazon and the Amazon logo are trademarks of Amazon.com, Inc. or its affiliates.